Congratulations to all the medal winners at the International Tournament. 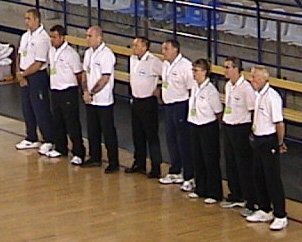 Early in the morning on Thursday 30th September 2004 the Jikishin team assembled at Gatwick airport for our trip to sunny Sicily for the 13th United Nations of Jujitsu Congress. and for the first time we were without Terry & Janet Parker who were unable to make the trip. After a hearty breakfast (healthy option of course.) and a small delay we were on our way to Catania airport where we were met by some of our Sicilian hosts. A one hour coach trip and we had arrived at the Gardini Naxos holiday village with the magnificent Mount Etna as our back drop. Our hosts Gery Spina & Giuseppe Giardinella and some of the management team were waiting to welcome us and greeted everybody personally. After booking in to the apartments everybody was free to explore the beautiful holiday village & hotel. Dinner was at 8-30pm. and all the participants were together for the first time on this trip, old friendships renewed, new friendships forged in the traditional U.N.J.J. way, Dinner was followed by a impromptu show in the outdoor theatre where of course Jikishin was duly represented by Willy Murley and Tony Park. A hilarious performance by both Willy &Tony (pictures will be available for blackmail purposes later) had everybody in hysterics. It was at this time I realised that being Prof Parker’s representative was not going to be plain sailing, as an emergency committee meeting was called to iron out some technicalities for the competitions and the meeting went on into the early hours. Friday was a free day and the sun was shining, everybody had the option of exploring or lying by the pool (bar was open early) or going to the beach, everybody except me that is, a full day of T V sessions and meetings with the local dignitaries & all of the delegates had to be dressed in full uniform (blazer & tie and 30 degrees plus) For many years now we have always thought that when Terry & Janet disappeared for hours on end they were off enjoying themselves, now I know differently, so come back Terry & Janet all is forgiven. Saturday, and the day of the competitions had arrived, the coach picked us up at 7-30am for our journey into Catania and some very apprehensive competitors prepared to do battle, Luca Martucci at 6 years old was the youngest Jikishin competitor and he was given the honour of leading the British team into the arena A day of very long & hard competition followed, no quarter asked, none given and every contest, win or lose ended with respect for the opponent., at the end of the day ( 21-00hrs) a very weary Jikishin team arrived back at the village. Sunday was the day of the Course and a good day was had by all. Our usual friends from around the world took their turn to teach on the mats and some interesting techniques were shown. 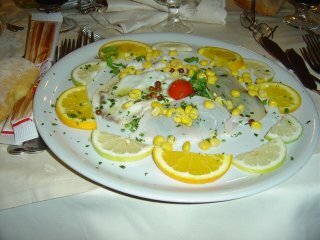 Sunday evening, and the Gala dinner, the starter was interesting, see picture, I took the picture in case I had to go to hospital, but first impressions can be very deceiving as it was delicious, a very Sicilian meal with liberal amounts of wine followed. The presentations were made and then it was time for the disco, this ended quite suddenly at about 1a.m. so we all made our way to one of the many bars near the village, and I’m pleased to say Jikishin tradition was upheld as the bar owner offered to cook us breakfast as the sun came up. Monday was recovery day, aerobics in the pool followed by a mini world cup with every country fielding a 5 aside football team and a party by the pool after dinner. 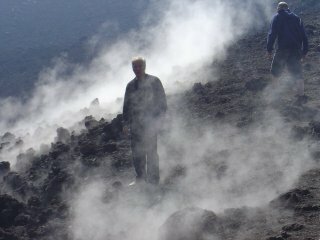 On Tuesday, the trip we had been waiting for, an excursion to Mount Etna, we had a luxury 56 seater coach for 19 of us so loads of room, our guide Patrizia was brilliant, Coach to 2000ft, cable car then large jeeps to the top of the second crater, and as Etna had been erupting it was a very surreal experience to be walking on the top of an active volcano and I for one would not have missed it for the world. In the evening after dinner, the German & Danish teams put on a demonstration in the outdoor theatre and everybody enjoyed the show. The last day was spent visiting the beautiful town of Taormina and of course a visit to the famous Greek amphitheatre. Thursday Morning and it is time to go home, and our hosts were there in force, good byes said and it was over for another year, another T shirt and plenty of good memories. I would like to thank all of those who made the trip for their support and of course for their company.